507548. SELEUKID EMPIRE. Antiochos I Soter. 281-261 BC. AR Tetradrachm (28mm, 17.13 g, 4h). Seleukeia on the Tigris mint. 479492. SELEUKID EMPIRE. Antiochos I Soter. 281-261 BC. Æ (16.8mm, 4.55 g, 9h). 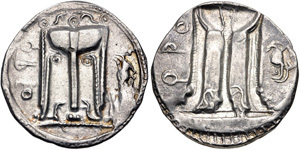 Seleukeia on the Tigris mint. 496927. SELEUKID EMPIRE. Antiochos III ‘the Great’. 222-187 BC. Æ (25.5mm, 12.96 g, 11h). Ekbatana mint. 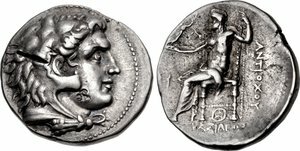 Struck circa 211-209/8 BC. 488176. SELEUKID EMPIRE. Seleukos IV Philopator. 187-175 BC. AR Tetradrachm (30mm, 16.58 g, 12h). Ptolemaïs (Ake) mint. 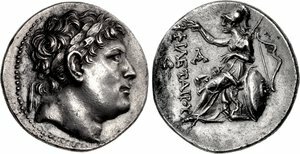 Struck circa 180-175 BC.